The day my second daughter was born, her diagnosis of Down syndrome threatened to crush my heart. The presence of an extra 21st chromosome seemed too powerful for me to stand up against it. I cried constantly, in fear that our lives would be covered with limitations. As if living in a bad dream, I wanted to wake up and find myself the mother of a “normal” baby, and the reassurance that Down syndrome was only a part of a nightmare. But it wasn’t a dream. Nichole’s almond shaped eyes looked straight at me. Then one day, I felt as if she was looking not just at me, but into me. The power of her eyes – of experiencing the fierceness of unconditional love – had a transforming effect in me. Indeed, I had been dreaming for most of my life and then Nichole came to wake me up. Love, joy, and peace became almost tangible. My eyes opened to the things that really matter in this upside-down world. Maybe I simply had a “weak heart,” and she showed up ready to fix it. Not only did my daughter awaken something inside of me; she changed me. God – using a little baby girl with Down syndrome – whispered in the corners of my being that needed to hear His voice and allow Him in. Although Down syndrome does not define Nichole, it is a part of my daughter that I cherish; it is a gift that I celebrate. I would not change my child. Every single chromosome she has is absolutely perfect and beautiful. She is exactly how God intended her to be. He created Nichole’s inmost being, knitting her together in my womb. Chromosome by chromosome. 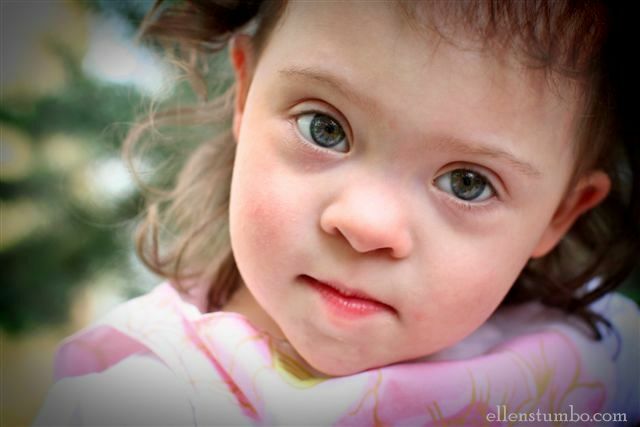 Down syndrome is not the nightmare I once thought it was, but rather, it is a detail about my daughter that opened up my eyes and gave me the freedom to celebrate all of life. I wish I loved as easily as she does, and that I gave my hugs as freely. I wish I celebrated others with the same excitement she shows. I count it a blessing to be her mother. The day I thought I had awakened to a nightmare, was instead the day that led me to wake-up to the mysteries of unconditional love. A little girl with Down syndrome opened up my eyes and my heart so I could live my life to its fullest. Certainly, something that we could all use a little bit more of in this world. Ellen Stumbo is a freelance writer, wife and mom to 3 girls. The beautiful life of her daughter with Down syndrome led to the adoption of a little girl with Cerebral Palsy. Ellen is just a mom writing about finding beauty in brokenness, and sometimes her love for Nutella. Ellen blogs full-time at ellenstumbo.com and is a guest blogger here at iamviable.org. Thank you for this. So many similar thoughts and gifts when I think about the joy of my little sister.